Designed for the snow plowing professional in South Royalton, the FISHER® HD2™ snowplow features a steel, trip edge straight blade and is available in 7'6", 8', 8'6" and 9' widths. The HD2 plow is built for tough, commercial plowing and last storm after storm. Fits 3/4 and 1 ton pickup trucks, as well as most skid steer loaders. 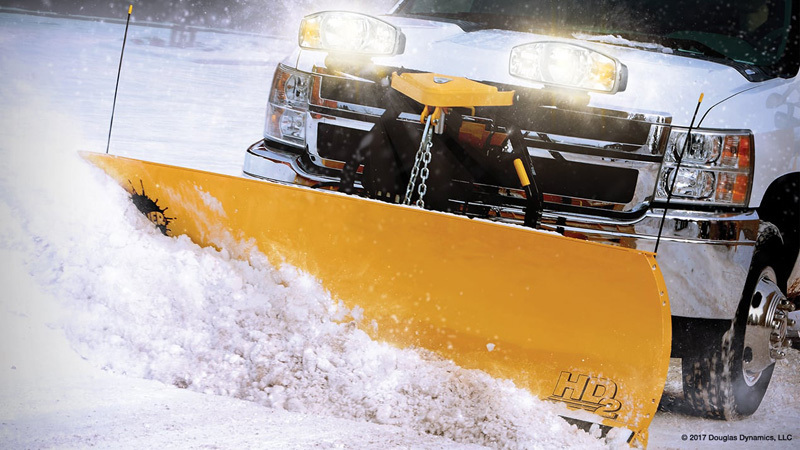 Featuring a rugged, 29" tall, powder coated, steel blade, the HD2™ snow plow is available in 7' 6", 8', 8' 6" and 9' widths, ensuring you can find the right blade for your vehicle. A standard high-carbon steel cutting edge provides increased wear resistance. The rugged HD2™ snow plow blade is reinforced with 10 vertical ribs welded into a rigid framework, which provides additional structural support and torsional strength, even under heavy load. The FISHER® HD2™ snow plow is also available with skid-steer mounting options. Blade Height 29" 29" 29" 29"
Lift Cylinder 1½" x 10" 1½" x 10" 1½" x 10" 1½" x 10"
Angling Rams 1½" x 12" 1½" x 12" 1½" x 12" 1½" x 12"
Plowing Width (full angle) 6' 9" 7' 2" 7' 7" 8' 1"
Thank you for submitting your request. We will respond at our earliest convenience. For immediate assistance, please call 800-877-5854 and reference this request.